NOT the high school class of logic and proofs that comes after algebra. Instead the real understanding and use of form, proportion, rhythm. Of how a circle, a square, tells itself how to divide or grow. Sounds mythical, magical, doesn't it? No wonder people call it 'sacred geometry'. Maybe with an elementary school math class. My grandchildren (7 and 9) are working with tiles and making patterns - tessellations - at their ungraded school. Here is yesterday's tessellation pattern on their dishwasher. Another pattern, mostly in green, is on the refrigerator. I've just ordered 200 more tiles because sharing is difficult when you're working out a pattern! I asked their teacher if I could show the class how to use a compass and how to divide a circle into its 6 parts, how the pattern expands. I sketched some diagrams on a paper scrap using a plastic cup as my compass. He liked the circles. 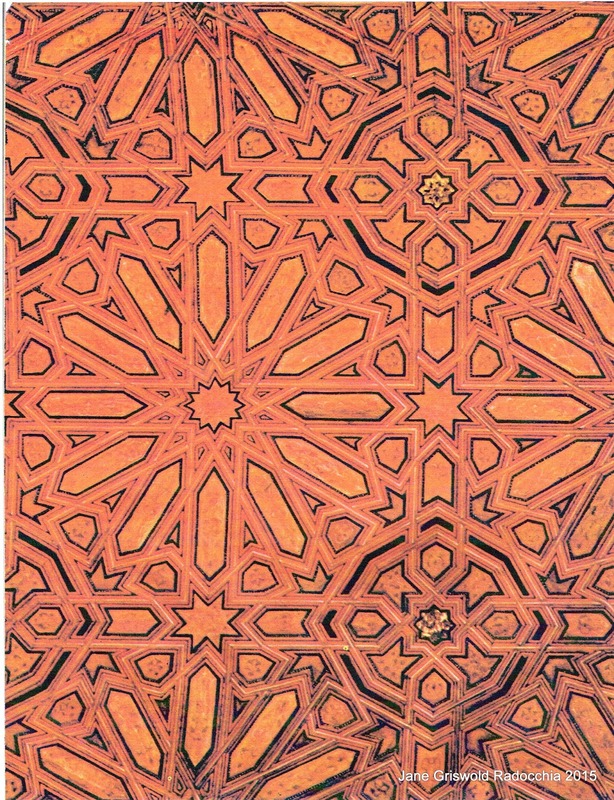 He liked introducing the students to the words 'radius' and 'circumference', to Islamic art through the tiles of the Alhambra. I am invited to share circle geometry in math class next week, two 30 minute sessions. When I told my grandchildren that I would be coming, the younger asked me what that word 'geometry' meant. The older told me that shape I called a diamond was really a rhomboid. Clearly this will be interesting. Whatever lesson plan I take into class may have to be discarded. So my goals are simple: practice drawing a circle with a compass; see what happens. I'll start with: why a point and a lead, how to set a radius, how to turn the compass by its knob. When we master that we can make some circles and then divide the circumference in parts. I want them to see that no matter where they start dividing the circle its outside edge will be 6 equal pieces. Then we can do daisy wheels - that will please everyone. I hope we are making patterns in less than 30 minutes. To help them see how a pattern can grow I will have this pattern along with others and a coloring book based on the Alhambra designs. 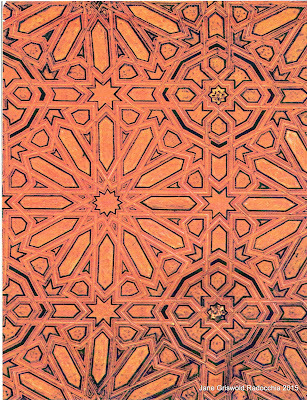 This is the painted and carved wood ceiling of the Hall of the Blessing in the Alhambra. It uses the circle divided into 8 parts, not 6 as I will be teaching. I am prepared for a simple discussion and illustration about dividing a circle into 4 parts instead of 6! If every student has enough manual dexterity (!) in the second sessions we may be able to see how the curved muntins for the arched window at the Old First Church in Bennington come from a circle. I think I will have on hand my copy of Norton Jestor's The Dot and the Line, a romance in lower mathematics.